Blue Springs South used a dominant second quarter performance en route to a 38-6 victory over Liberty North on Friday, August 28, at William Jewell College. The Jaguars outscored the Eagles 17-0 in the quarter and took advantage of two interceptions to set up a touchdown pass and a field goal. Jaguars quarterback Noah Nigro started South’s big second quarter with a 25-yard touchdown pass, the first of two on the night, to receiver Jerome Hawkins. The junior ran a corner route to the end zone, and Liberty North’s safety was late getting over the top, leaving Hawkins with an easy touchdown catch for a 14-6 lead. The Jaguars grabbed their first of four turnovers on the ensuing possession when defensive back Cale Connors picked off Liberty North quarterback Mitchell Miller on a third-and-six at midfield. 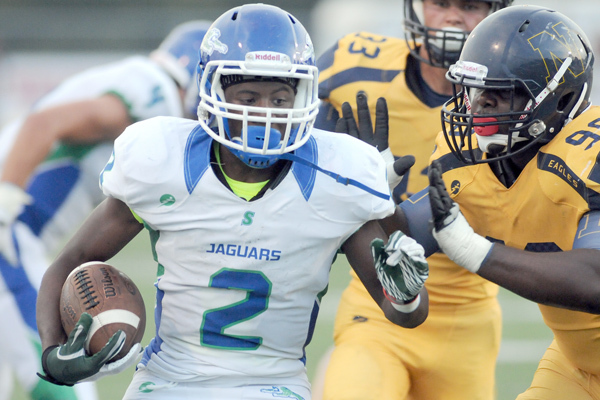 It took just one play for South to hit pay dirt again. Senior running back Adam Cofield lofted a beautiful pass down the field to a wide-open Jake Lamb on a halfback pass for a 47-yard touchdown. Cofield sold the run fake well enough to get Liberty North’s corner to bite, and Lamb easily ran past him and found himself with nothing left to do but catch it and run for the end zone. South’s defense struck once again when defensive back Will Hughes grabbed the first of his two interceptions on the night just two plays after Lamb’s touchdown. The Jaguars got a 21-yard field goal from Jake Roark with 1 minute, 31 seconds remaining in the half to give them a 24-6 halftime lead. After the two teams traded interceptions to start the third quarter, Blue Springs South strung together an 87-yard, 15-play drive that ate 7:00 off the clock. Nigro found Briley Moore-McKinney on third and goal from the 8-yard line to put the Jaguars up 31-6. Myles Davis added his second touchdown of the night from 1-yard out to finish the scoring in the fourth quarter. Davis’ run capped another long drive. This one lasted 10 plays and covered 47 yards. Oder said the team’s offensive execution was a lot cleaner this week. Nigro finished the night 10-for-17 with 103 yards passing, two touchdowns and an interception. Cofield added 58 yards on 11 rushes and was 1-for-1 through the air for 47 yards and a score. It was a focused group, despite the fact a matchup with Blue Springs looms on the horizon.